Notre Dame used its superior inside size to overpower UConn on the boards, 54-37, in the semifinal game Friday night. The Irish grabbed 22 offensive rebounds leading to a 22-9 edge in second-chance points. Notre Dame exploited this advantage to overcome a second straight game of poor first-half shooting. Top-ranked Baylor presents a different challenge with its formidable front line of 6’7” Kalani Brown (#21) and 6’4” Lauren Cox (#15). The Irish will need to do better than the combined first quarter 10 of 40 shooting output against UConn and Stanford. After scoring just 26 and 29 first half points in the last two games, the Irish erupted for a combined 110 second half points. The Irish may not be able to dial up those results against the Lady Bears’ stingy defense. Stanford handed Baylor its only loss of the season on December 15th — 68 - 63. Stanford limited the Lady Bears to 19% first half shooting, built a 41 to 24 lead after the first two quarters, and held on for the win. Since its lone loss, Baylor has reeled off 28 wins in a row and started the NCAA tournament as the #1 team in the polls. Baylor averages 81.7 points per game. Like the Irish, they’re one of just four teams that average over 50% from the field. They also don’t have a heavy reliance on three-point shooting and only average 3.1 made threes per game. The Lady Bears were 0-3 from distance in winning Friday night’s other semifinal against Oregon. Baylor is a ferocious rebounding team and average 47.4 boards per game. The Lady Bears hold a 17.6 per game rebound advantage over all opponents. Baylor averages 22.4 assists and 13.0 turnovers per game for a 1.7 assist to turnover ratio. They also average 7.6 steals and 7.2 blocks per game. 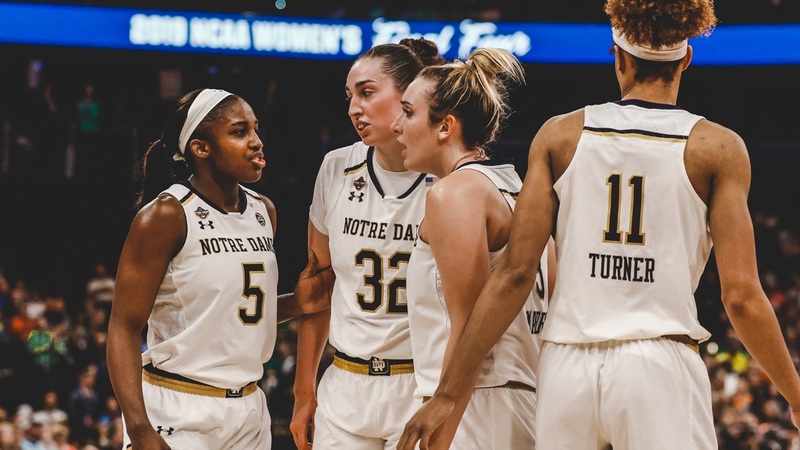 Notre Dame’s season stats are similar — except the Lady Bears are taller, deeper and play tighter defense. Brown is the leading scorer at 15.7 points per game — one of four Lady Bears to average over ten points per game for the season. Brown makes 61.3% of her field goal attempts and is a solid 77.9% from the free throw line. Cox, a player Notre Dame recruited heavily, is the team’s leading rebounder and shot blocker. She averages 13.2 points and 8.4 rebounds per game. She’s blocked 94 shots. She’s also an excellent passer with 140 assists vs. 55 turnovers (2.5 A/TO). Chloe Jackson (#24), a 5’8” 5th-year guard, leads the team with 198 assists. Her A/TO ratio is 2.5. Jackson started her college career at NC State before transferring to LSU. She transferred to Baylor as a grad student and has played a critical role in Baylor’s success. She averages 11.3 points per game and leads the team with 60 steals. She’s only made one three-point basket all season. Juicy Landrum (#20), a 5’8” junior guard, chips in with 11.2 points and 5.1 rebounds per game. She’s made 61 three-point baskets in 161 attempts (39.6%) this season, which represent over half of Baylor’s total for the season. The fifth starter, Didi Richards (#2), is a fierce defender and forced Sabrina Ionescu into a 6 - 24 shooting night. The 6’1” sophomore averages 7.2 points and 3.8 rebounds per game. She makes 52.0% of her field goal attempts, but only converts 56.7% of her free throw attempts. Baylor coach Kim Mulkey shortened her bench against Oregon with only two reserves seeing action for just ten minutes. Cox and Jackson played all 40 minutes and Landrum only had one minute of rest. The reserves who played against the Ducks were NaLyssa Smith (#1), a 6’2” freshman forward. For the season she’s averaged 8.2 points and 5.1 rebounds in just 15.2 minutes per game. She played just eight minutes Friday night. Moon Ursin (#12), a 5’6” sophomore guard only saw two minutes of action against the Ducks. Smith is one of four McDonald’s All American freshmen on the Baylor team. The others are Queen Egbo (#25), a 6’3” forward, Aquira DeCosta (#4), a 6’ forward, and 5’9” guard Honesty Scott-Greyson (#10). Brianna Turner is on the court before any of her teammates every game to practice free throws. This extra shooting and focus is paying dividends. Turner made 61.2% of her field goals over her first three seasons. She’s up to 70.3% this season and has improved to 90.3% (28-31) over the eight games since the start of the ACC Tournament. Her five blocks against UConn gave her the all-time Notre Dame record, which was held by Ruth Riley. She’s averaged 4.2 blocks per game in the five NCAA games, up from 2.8 over the whole season. Turner became the third 2,000 point scorer on the Irish squad with two free throws late in the third quarter against the Huskies. She now has amassed 1,036 career rebounds — the all-time best at Notre Dame. Jess Shepard is averaging 19.5 points, 12.6 rebounds, and 4.6 assists per game in the five NCAA tournament games. She’s up to 143 assists for the season. Marina Mabrey finally found her shooting touch in the second half against UConn. After making just 1 of her 8 field goal attempts in the first half, she responded by making 3 of her 6 second half shots including 2 for 3 from beyond the arc. She registered a career-high 12 assists, which is also the most in an NCAA semifinal game. Her 12 point effort brought her NCAA scoring up to 4.8 points per game. She is averaging 7.0 assists in the tournament with a 3.9 assist to turnover ratio. She’s now up to 168 assists for the season. Arike Ogunbowale turned on the scoring in the second half. After just 2 points in the first half (1-7 from the field), Ogunbowale scored 21 in the second half and 14 of ND’s 29 fourth quarter points. She was 6 for 11 from the field after the break and made 3 of her 5 three-point attempts. She’s up to 146 assists on the season. Jackie Young had an off shooting night against UConn — just 5 for 15. But, her three-point basket with ND down nine in the fourth quarter ignited the ND comeback. She’s now up to 1,347 career points with hopefully another season to go. ND’s starting five have now amassed 10,151 points collectively. Notre Dame has now won 999 games since women’s basketball became a varsity sport. The Irish can seal a second straight national championship if they can pick up win 1,000 against Baylor. Game time is 6:00 pm eastern and the game will be televised on ESPN.